I can’t believe I have waited this long to ink up this stamp set - the beautiful Hanging Garden. I love the simple effect of night of navy and crisp whisper white together don't you? To me it is very elegant look. The strip of spotty paper is from the tutti frutti designer series paper. I used my ever faithful oval framelits and stitched framelits to crop out the hanging basket. 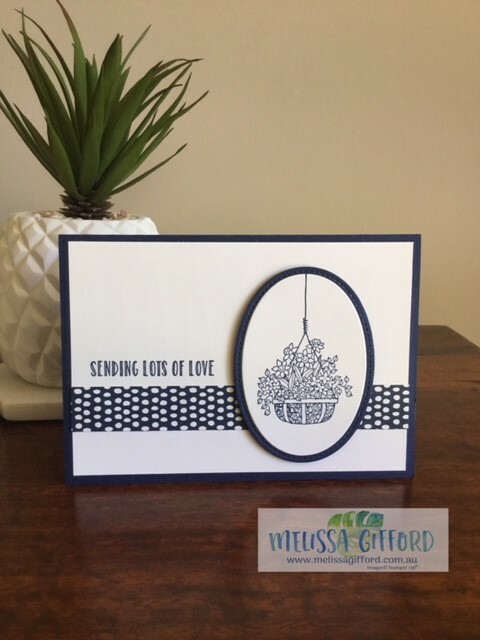 The sentiment comes from the same hanging garden stamp set. I think this is a sentiment we should all use a bit more often. The idea from this card came from Mary Fish - the queen of simple, elegant cards! Remember time is running out for your chance to get some fantastic FREE sale-a-bration items. Sale finishes 31st March 2018.